Listened to the race on the wireless, will watch it later but just saw the BBC News report. 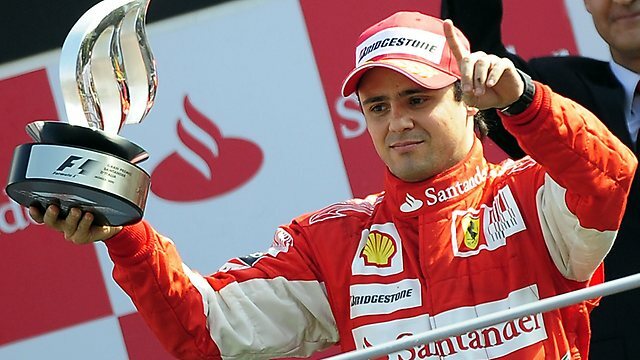 Massa's tyre failure with the spin looked the most spectacular, remarkable he could continue. There are questions to be answered, but my god Hamilton is annoying me more than ever. He's spent ages moping around lately (apart from yesterday) then gets on his high horse after the race. Yes he has every right to be disappointed, but I didn't like his tone in the BBC interview at all. I preferred the moping! He was getting high and mighty about safety, but that's not what he was really fussed about. It was about losing the race. I felt the same when Vettel and Red Bull were trying to get the tyres changed. A PURPLE under yellow flags!!!!!!!!!!!!!!!! thats disgusting! Interesting point, were the teams using the left hand rears on the right? donald29 wrote: Interesting point, were the teams using the left hand rears on the right? lol, ofcourse they were. Pirelli say so. mikhailv wrote: A PURPLE under yellow flags!!!!!!!!!!!!!!!! thats disgusting! That should have earned him a 5-place penalty for Germany... Let him keep the win, but Mercedes is getting away with so much lately. "Right now I'm having amnesia and déjà vu at the same time. I think I've forgotten this before." Yeah but neither does a 5 place penalty really. 'Dont worry, go set a purple sector when marshalls are on track, even though one died last race, and you can win the race, just start 5 places back at your home race! Oh wait, we dont want a race-winning german driver and team with a penalty at their home race! Sod it, reprimand'. if maldanado did it, it would be a DSQ. The disparity of this sport is disgusting. Its utterly ludicrous. It seems that Mercedes is slowly taking the role of "Being impossible to punish" team. I mean, really, what else do we need? And, yes, that was an unsafe release by Ferrari. BTW big thanks to the "on site" reporters for putting up cool pictures and anecdotes from the action. F1EA wrote: BTW big thanks to the "on site" reporters for putting up cool pictures and anecdotes from the action. No problem, it was brilliant. mikhailv wrote: Rosberg escaped penalty then. I dont want him to lose the win or anything, but considering a marshal died last race, and he was setting fast times under double yellows with marshals on track? Surely a 3-place penalty would suffice. I mean, we lost a marshal last week and the race winner goes and belts it through the sector. Its not a great example is it? Also surprised Alonso didnt get a penalty for the unsafe release. Did he not get anything because he recognised and stopped for Rogro or what? If that happened and if my calculations are correct: then it would be Webber, Hamilton, then Rosberg..
With Vettel's unfortunate retirement, Raikkonen is the only driver to have scored points in every race this season. Last time a driver won the championship without scoring a point in British Grand Prix was 1999.